Millennials form a large part of the global corporate workforce today. They are tech-savvy, hyper-connected, and mobile, and expect instant access to everything – news, shopping, banking, social contact, entertainment, and yes – to learning. A staid computer with an elaborate Learning Management Systems and some Web Based Training no longer rules the roost when it comes to e-learning. Training has taken newer forms – games, videos, interactive PDFs – that can all be accessed on multiple devices. In step with this need, a global community of Instructional Designers and programmers formed Adapt Learning – a collaborative open source project that works for the benefit of the entire learning and development industry. Under the project, the Adapt authoring tool and the Adapt Framework are available for free. Developed in the latest version of the HTML standard – HTML5, Adapt courses are fully responsive, for multiple devices, and intuitive even for a non-technical learner. Here are a few examples of Adapt courses with articles, blocks and components marked and labelled. An Adapt course viewed on a computer (articles, blocks, and components marked and labelled). Note: In developed courses, articles and blocks may not always appear as distinct items. An Adapt page is constructed by combining a wide range of often interactive components within different blocks and articles – in any number and mix required. Articles may be used for different chapter-like sections within the content, blocks may be smaller topics within, and components may apply to individual content pieces. 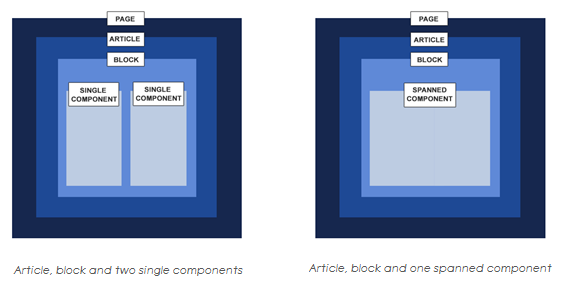 This ABC (Article-Block-Component) structure is simple in design and easy to navigate. Adapt developers produce their custom plugins and make them available to others. The deep scrolling page layout in Adapt courses allows for unlimited scrolling and leverages much of the latest thinking in web design into the world of elearning. This includes ideas like parallax scrolling, hamburger menus, card layouts, and loading & motion animations. 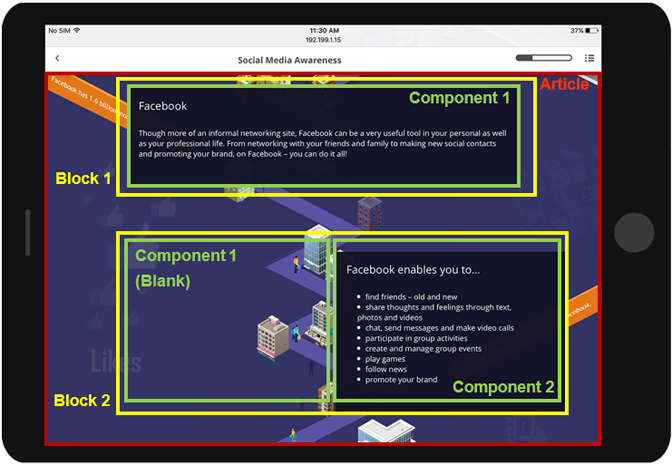 The Adapt Framework also allows for every element of the design to be bookmarked so there is flexibility in what content the learner wants to go back to when resuming a course. Navigation in Adapt courses is achieved via scrolling on desktop devices or gesture on mobile devices. This layout reduces the risk of overruns as components do not overlap each other on screen resize but smartly modify their layout to match the device’s dimensions. This makes Adapt suitable for any course that is likely to be localised into another language, as different language characters occupy different sizes. Adapt developers from all over the world are constantly and diligently at work to enhance the framework and authoring tool’s capabilities. The Adapt Framework is currently at version 2.0.14, with the last big update bringing in features like full keyboard and screen-reader accessibility, support for right-to-left languages like Arabic and Hebrew, bookmarking, multi-language course support and assessment results. With its innovation and flexibility, it’s easy to deduce that the Adapt Framework lends plenty of benefits for e-learning development. Here are a few of them. The framework comes with its own Adapt authoring tool, which makes Adapt courses easy to develop. Courses are fully and intelligently responsive – a course developed once can be easily accessed on multiple devices regardless of the varied forms of content within it. Templates and plugins have a fluid design and are easy to customise. Plugins can be imported and edited easily, hence allowing for change of course design, style or images at the touch of a button. Only one version of the framework is needed to build and maintain Adapt courses. This eliminates compatibility issues between the framework and the components), hence making the process cost-effective. Changes made to Adapt courses can be previewed in parallel with the development. Therefore, development of Adapt courses is speedy. The deep scrolling layout used in Adapt is natural & user friendly as it is in line with latest web design standards. Even with all its differences, Adapt allows its courses to be launched on and tracked in any SCORM-compatible LMS. Since Adapt courses basically act as web resources, they are searchable. This is not possible in locked-down Web Based Training courses. The HTML5 output of Adapt courses conforms to the AA level (Priority 2) of the Web Content Accessibility Guidelines, which enables a high level of accessibility for most user groups. Translation of Adapt courses is simple since it’s a direct editing of text files. Being a part of an open source project, the Adapt code can be freely downloaded, customised and used. 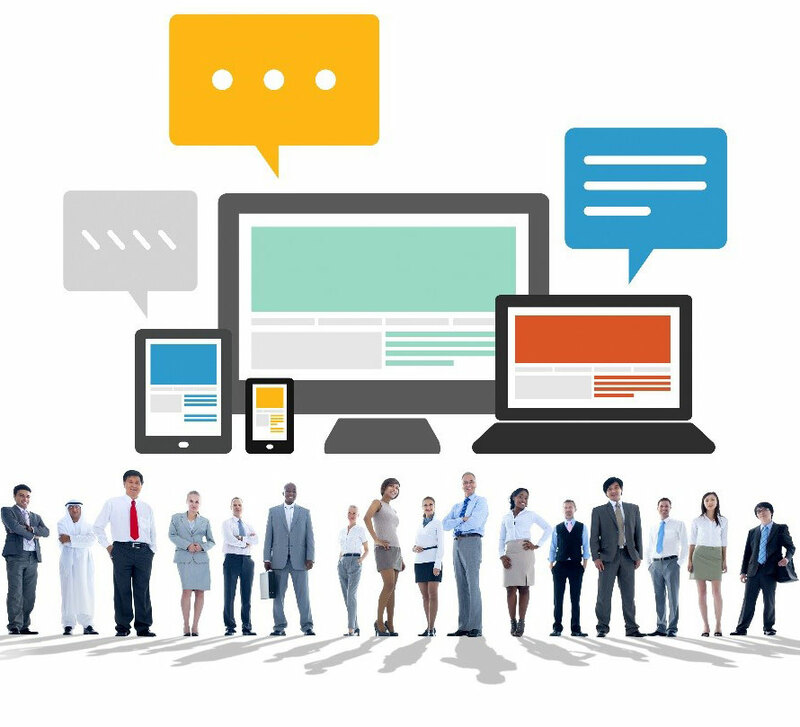 The Adapt Learning project is community-driven – developers and contributors collaborate and create better elearning for all. The project has an evolving roadmap, with the community constantly enhancing functionality and performance of the framework and the tool. Policies like Bring Your Own Device (BYOD) and Wear Your Own Device (WYOD) will soon become the norm, and Adapt Learning is fully equipped for this future! See some examples of elearning built in Adapt by Newgen on the Newgen collaborator page. 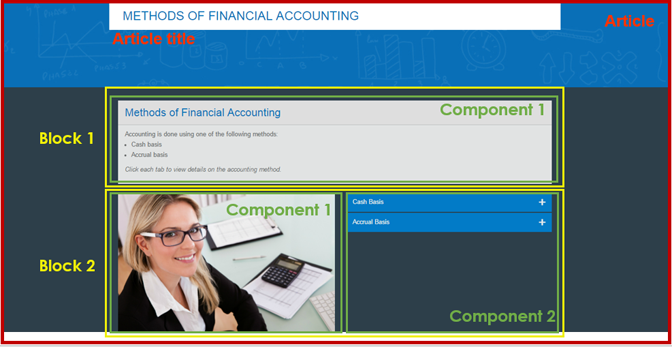 The Showcase page has lots more examples of courses built using the Adapt Framework.